Ok, I know everyone has their own way of doing this. But I’ll tell you mine. I usually use one of two dough recipes. Either the recipe from The Greens Cookbook , or the one from The Figs Table . Recently I’ve been adding an additional step, which is to let the doughs rise a couple of times instead of just once, or overnight in the fridge. 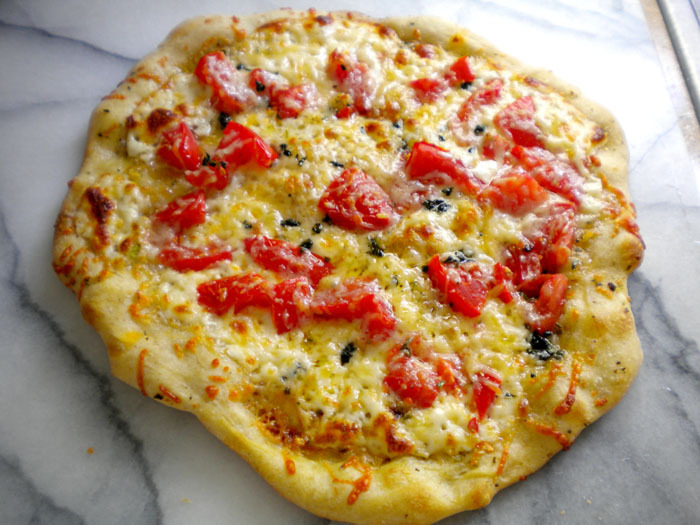 This fridge rise will automatically happen for the second pizza I make anyway because the dough makes enough for two go ’rounds. I preheat the oven to 500 degrees for like 30 minutes, at least. It needs to get really hot. Then I put a couple of tablespoons of olive oil in a small bowl, add some dried herbs, some seas salt, and a crushed clove of garlic. 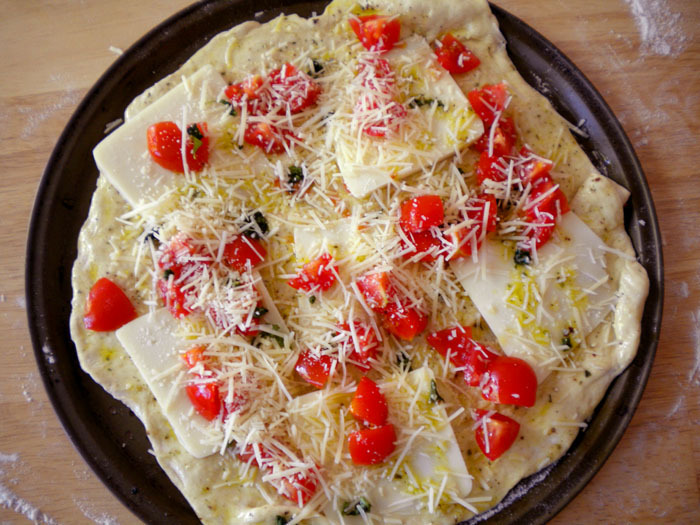 Once I toss or roll the dough (it doesn’t really matter which) and place it on a cheap-o walmart pizza pan, I brush some of the olive oil mixture on it. Not too much or it gets greasy, and not in a good way. Then I put on some chopped tomatoes, some sliced (not grated) mozerella (fresh or regular), and some chopped up basil leaves. Then top the whole thing with grated parmesean. Then cook it for about 10 minutes, give or take a minute or two. Keep checking it. Sometimes I’m in the mood for it to be sort of soft and chewy (less time in the oven) and sometimes I like it to be crispy (more time in the oven).